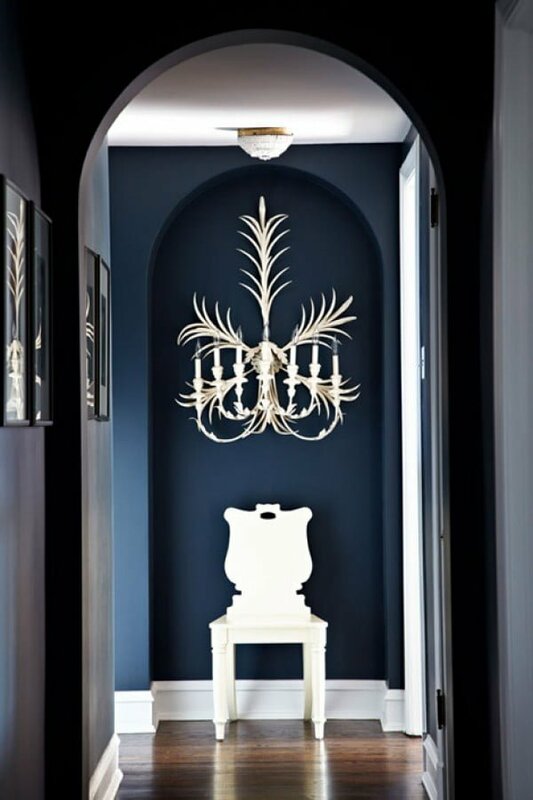 Navy blue as a color in interior design is traditional and timeless. It creates a sophisticated look and casts just a little bit of a mysterious vibe on the look of a room. 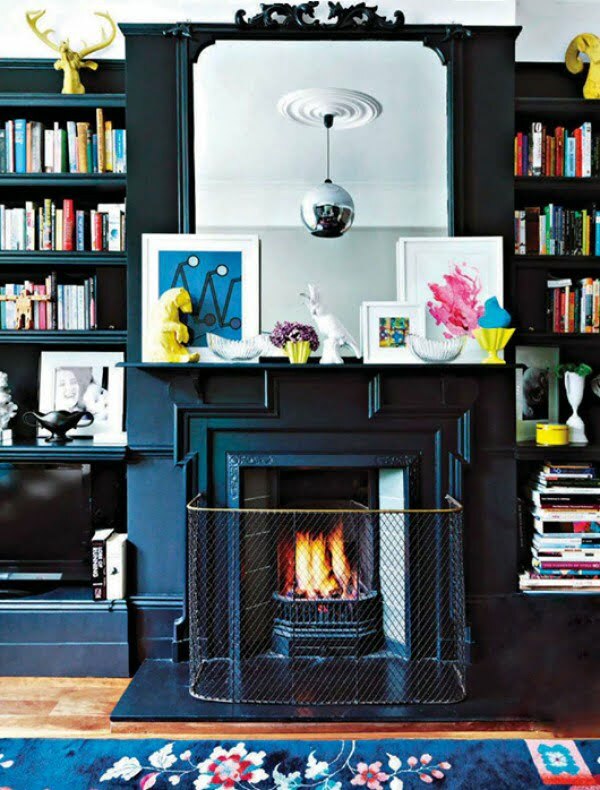 And because this color with its variations is one of decor classics, you can almost never go wrong with it as you would with black. Compared to black, navy blue is just a tad more “dangerous” with its mysterious qualities. Perhaps that’s why we’ve seen these colors being switched lately in the interior design trends. “Safe” is being redefined as navy blue is used for kitchen cabinets, bathroom tiles and everywhere where neutral classic is to be expected. And yet we can see how much charm this switch actually adds to interiors. 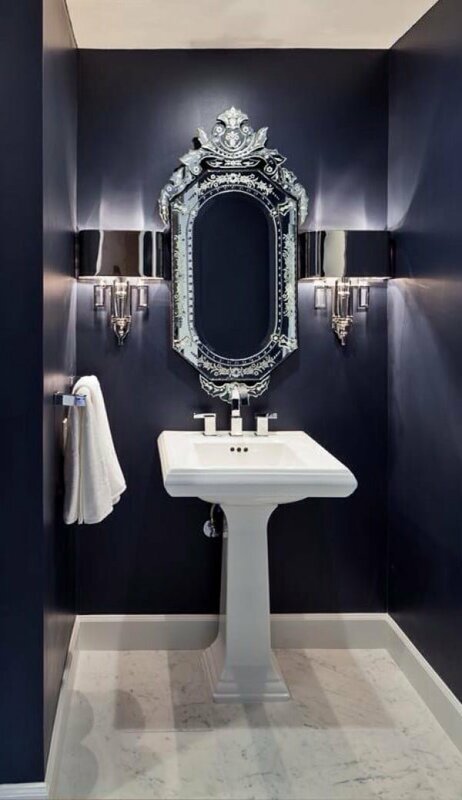 Bathroom walls painted navy blue create a dark decor scheme. Contrasted with white marble floor and metallic accents of the mirror and light fixtures create a luxurious look. This kitchen backsplash takes navy blue to the next level with a mosaic in different shades of the color. 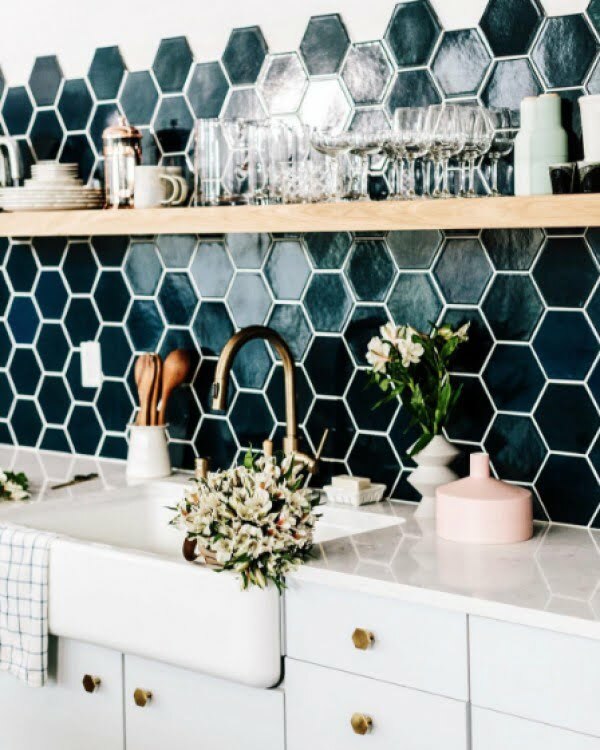 Honeycomb is an interesting pattern that allows the color to flourish. Contrasted with white glossy cabinets and brass accents makes a winning combination in this color scheme. 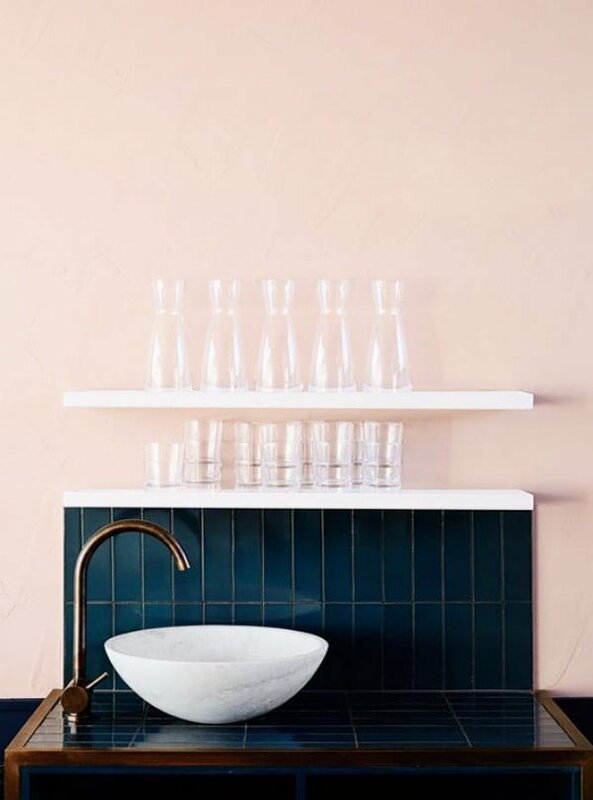 Choosing navy blue tiles in this bathroom decor is the right option as we can see how much contrast it creates with white shelves and bright but soft walls. There’s so much drama in this design yet you can feel the sophistication. Choosing navy blue walls and flooring is a risky option but it works really well in this case. The dark theme doesn’t overcrowd the room as it is broken with lots of wooden accents and contrasting wall art. When you choose dark navy blue as a background, it creates so much decor interest when you put a lot of bright pieces in the foreground. This works really well with display cabinets. 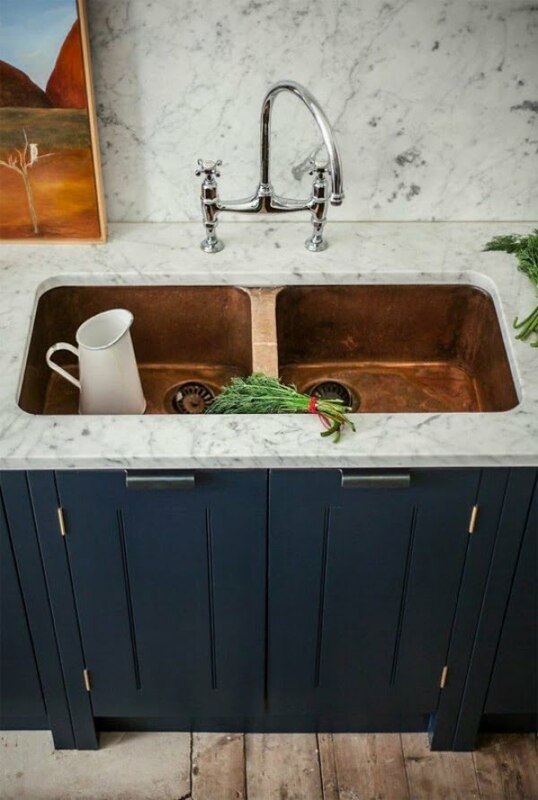 As you’ve probably noticed, navy blue works so well with brass and copper accents. Seeing that the latter is also trending, we’re really pushing the edge by combining the two. As a traditional color and one that can replace black, it works as an accent too. 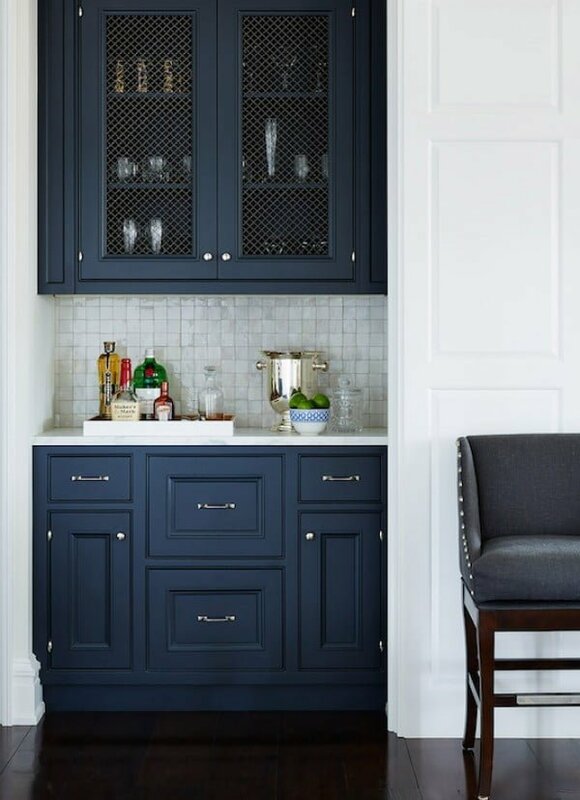 White walls make the perfect background for a deep blue cabinet and help it stand out. We’ve had black glossy surfaces that create luxe accents, the same can be done with navy blue. 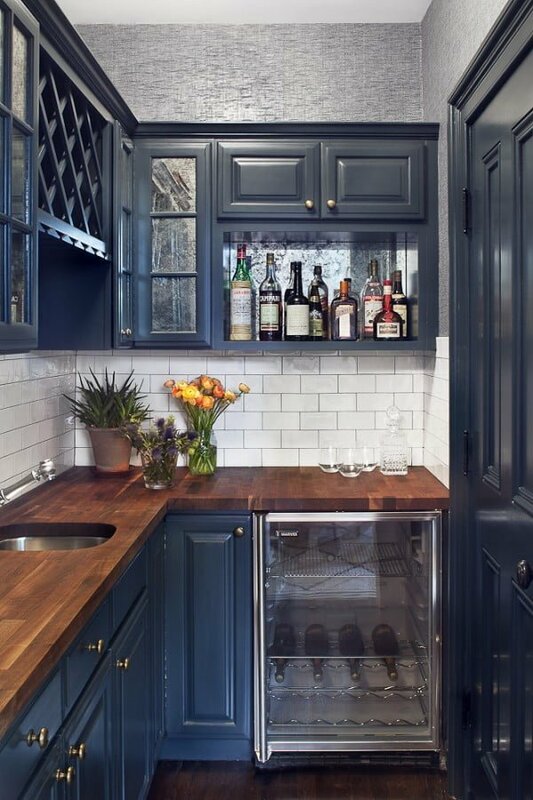 This kitchen design oozes sophistication with deep blue cabinets, solid wood counters and subway tiles. 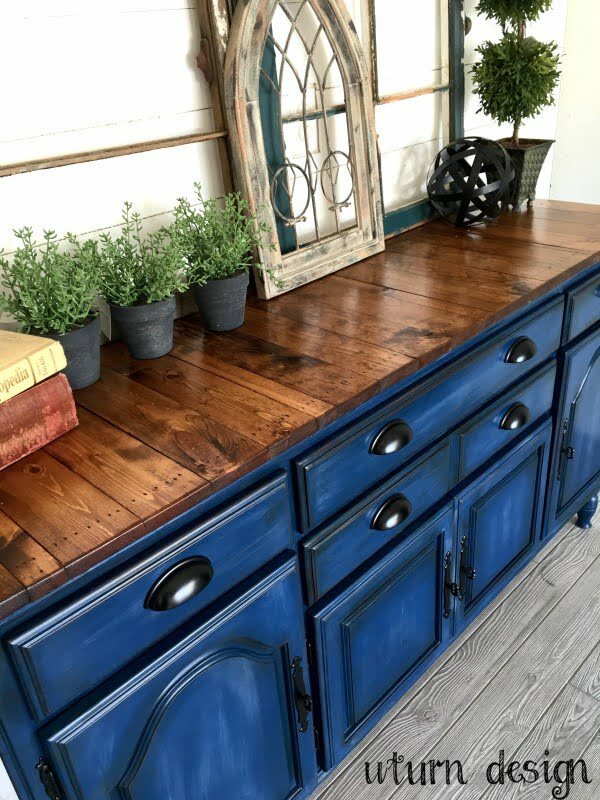 We’ve already seen how well navy blue works with wood accents and it can be used the other way around. 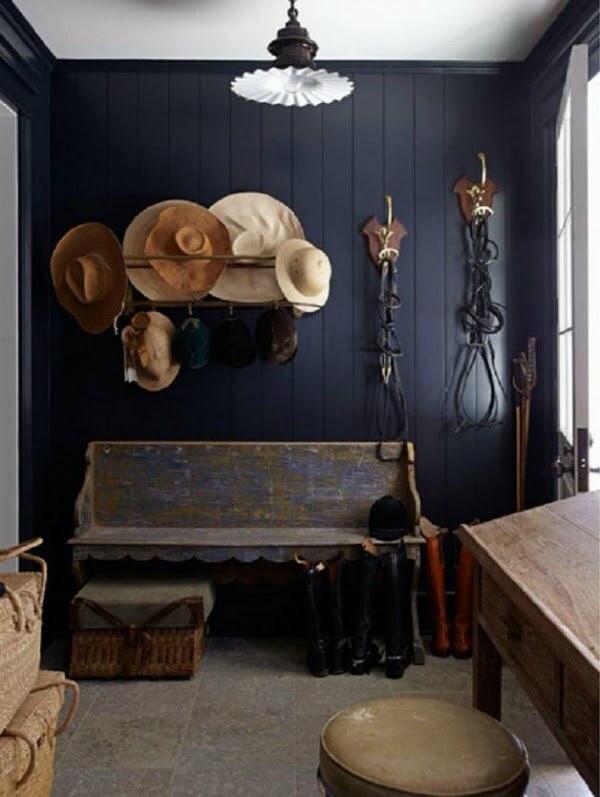 Dark blue makes classy accents in decor dominated by rustic wood. 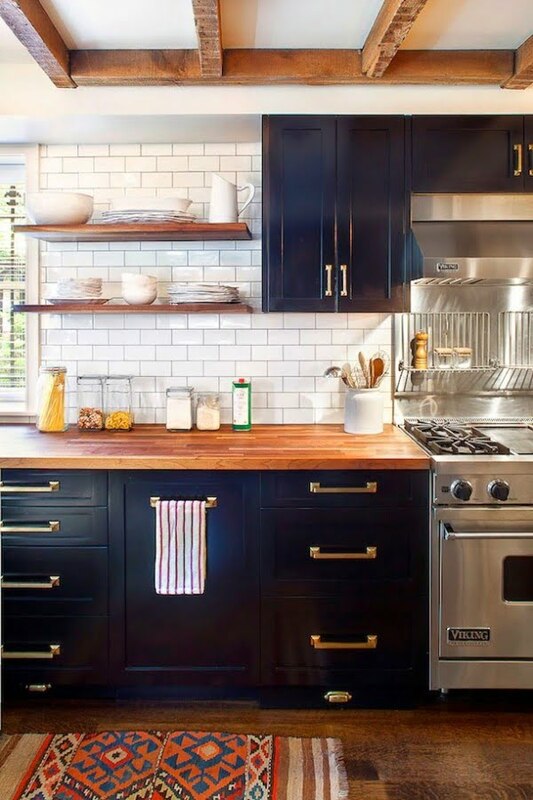 White kitchen walls with black (or grey) cabinets is considered a timeless classic. 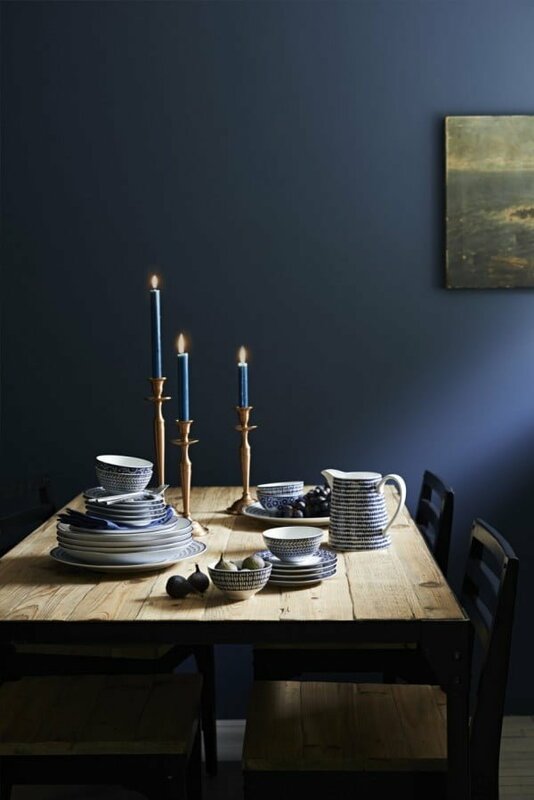 But you can add just a little bit more decor interest with dark navy blue. Whenever you have navy blue walls, they can always be decorated with white accents for a timeless classic look. Velvet as decor material may as well make its rounds to design trends too. 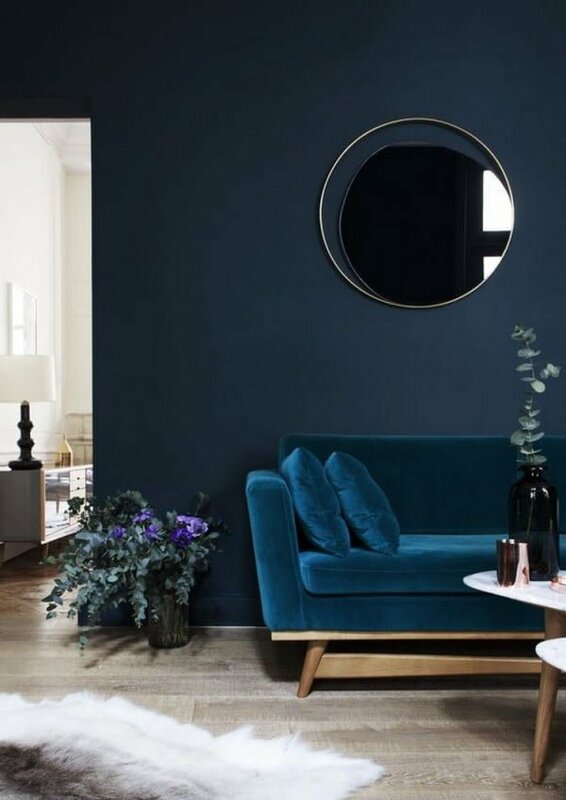 A sofa covered in deep blue velvet makes a soft accent and it works against dark backgrounds as well as a contrasting piece against white walls. 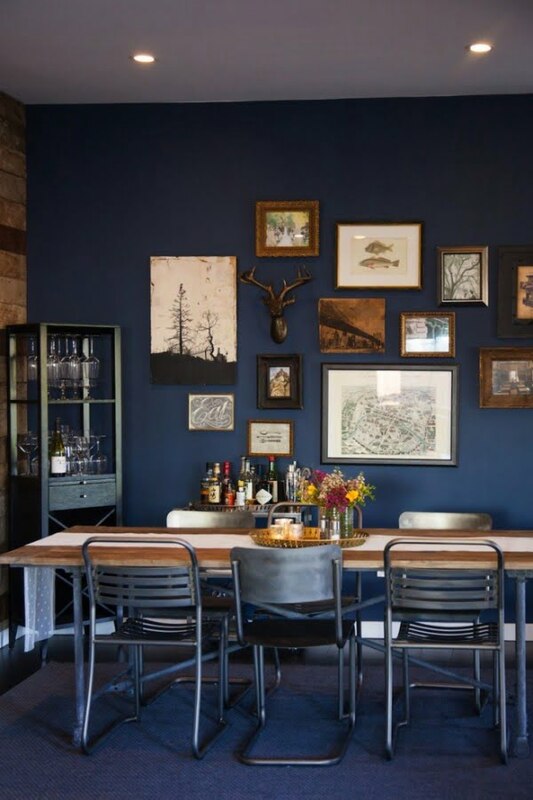 Here’s another case of navy blue walls adding sophistication to rustic decor. We really love how it makes the worn down look become classic. 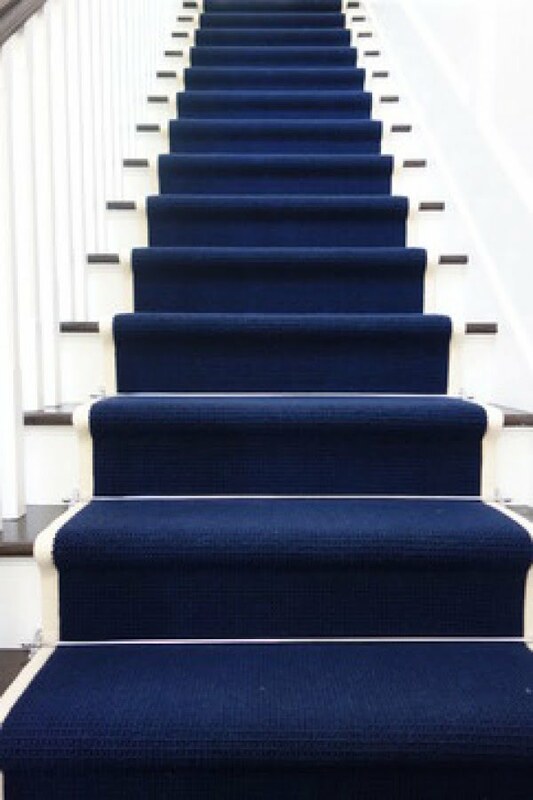 Used as carpeting on the staircase navy blue is a great alternative to grey and black. Again, it is the case of adding just a little bit more decor interest. Marble is classic and luxe, and we know really well how it works with black. But it’s even better with navy blue and copper accents. This is a truly luxe combination. You can of course go with fully deep blue decor for a very dramatic look. In this case, warm rustic wood furniture is used in contrast to the dark theme. 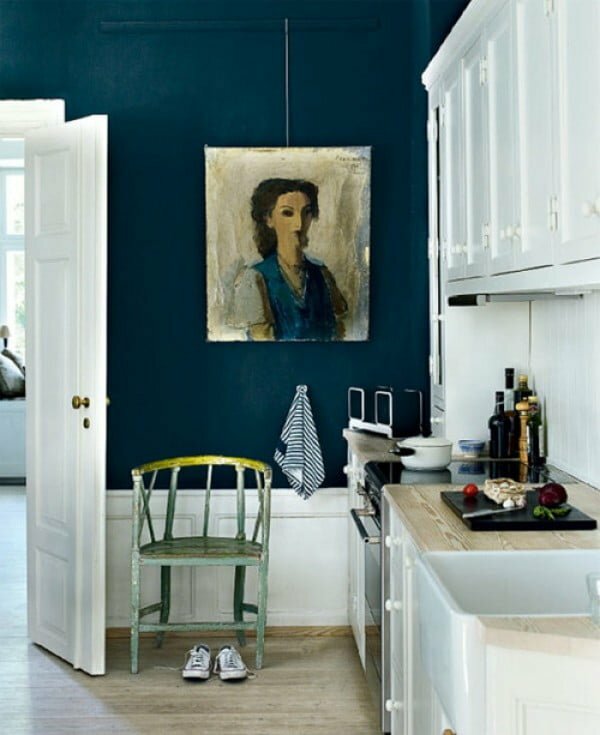 Likewise, navy blue kitchen walls work well with white cabinets and create a timeless classic look. We always like to add more decor interest in any way possible. Using chalkboard paint adds texture that makes this design very attractive. 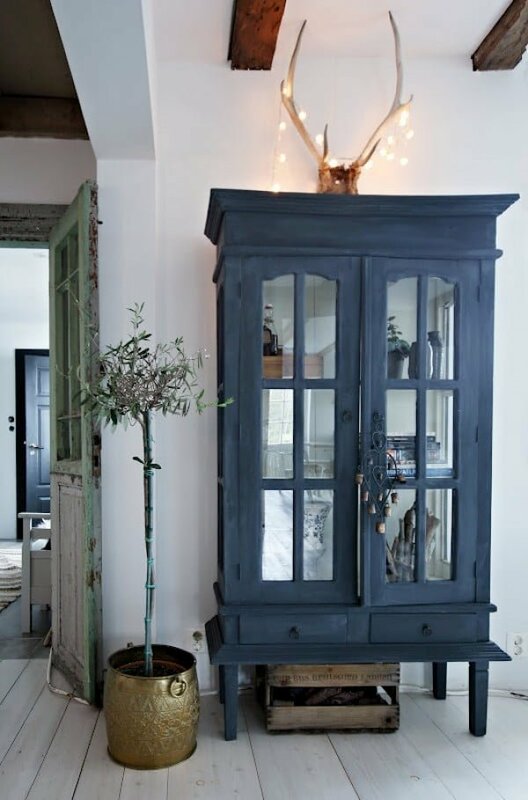 Here’s another great example of navy blue being used with wood accents as a winning combination. 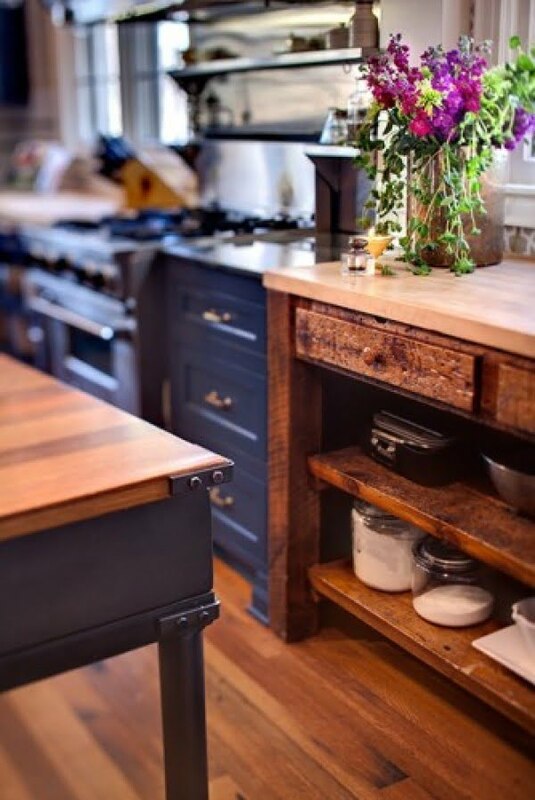 There are so many things to like in this kitchen design, from dark navy blue cabinets, to wooden counters, subway tiles, hardwood floors, metallic accents and rustic wood ceiling beam accents. Finally, you can add navy blue in small accents, even coasters will do, and you can even DIY. 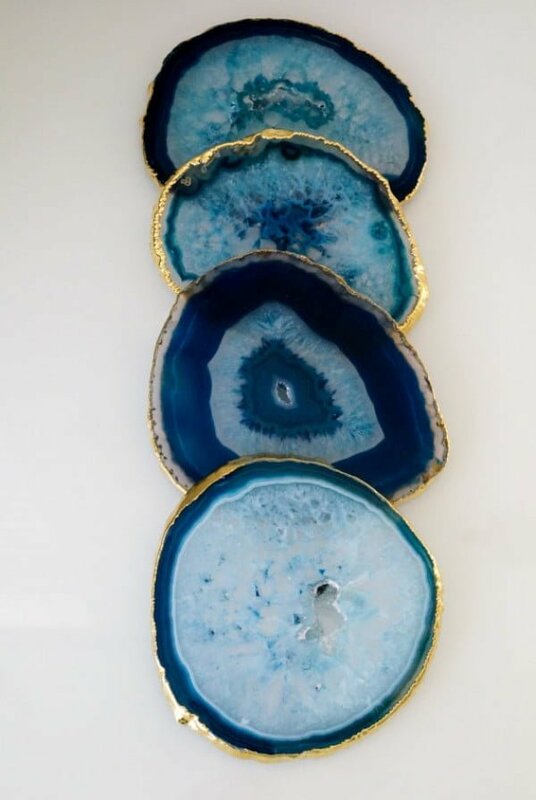 Blue agate is the perfect material for natural navy blue shades.